Home »Concerts»Thomas Anders & Modern Talking Band – Live in Washington D.C.! Thomas Anders & Modern Talking Band – Live in Washington D.C.! Featuring Bad Boys Blue, Fancy, Lian Ross – Saturday, August 11 2018 – in Washington D.C.! 3.5 hours of high energy music, featuring The Gentleman Of Music – Thomas Anders (original magnetic voice of Modern Talking) accompanied by the Modern Talking Band! Bad Boys Blue featuring John McInerney, Fancy, and Lian Ross! Opening entertainment by DJ BPM Spinning the best of 80’s hits as soon as the doors open. So put your dancing shoes on and come on over for this historic night! Host Iman Huschmand. 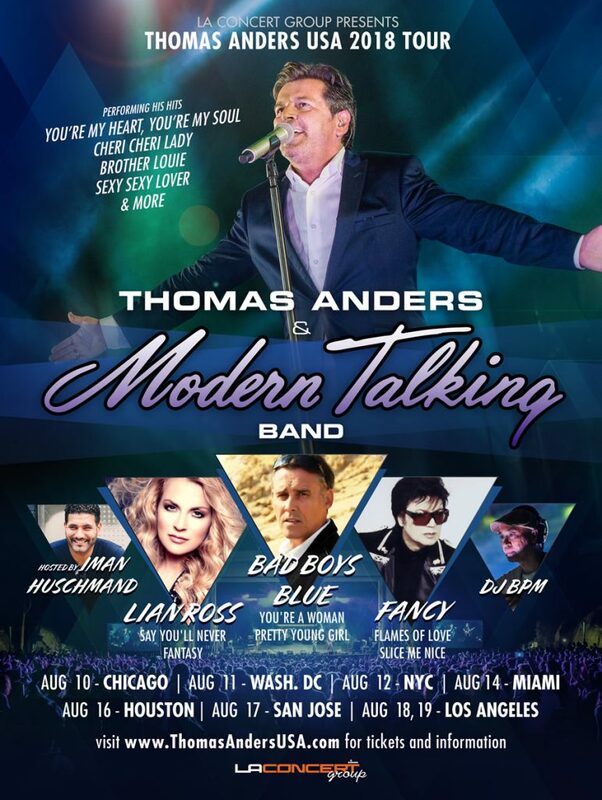 ← Previous Previous post: Thomas Anders & Modern Talking Band – Live in Chicago! Next → Next post: Thomas Anders & Modern Talking Band – Live in NYC!